Dewar Corp is family owned business. There have been 3 generations in this Beekeeping Enterprise. We are based in the picturesque Scenic Rim. At the base of Mt Greville is where home and business are based. The business has diversified into several aspects of the age old tradition of Beekeeping. Our Founder Laurie Dewar OAM, saw the need to develop a Pollen Supplement when producing honeys like Australian Manuka, Yellow Box, Yapunyah, etc. where there is a shortage of high grade pollen. L & P Dewar acknowledge that previous use of reduced fat expeller soy bean flour has been a cheap way of feeding bees on a pollen deficient honey flow. L & P Dewar have used RIRDC research (Manning and Somerville) to develop a complete pollen replacement supplement. This product (Bee Build) has undergone significant field testing since the arrival of SHB in 2006. Bee Build is now commercially available. Don Keith formerly from Inglewood has been a beekeeper for 53 years, read more about him in the Sunshine Coast Daily. On retirement we moved near to Bribie Island. Fortunately for my ongoing interest in beekeeping, Dewar Apiaries have kept bees on Bribie Island for many years and Laurie sometimes uses my assistance. Bribie is a low, flat, swampy sand island extremely difficult to traverse. Until recently Mellaleuca was the major beekeeping flora. 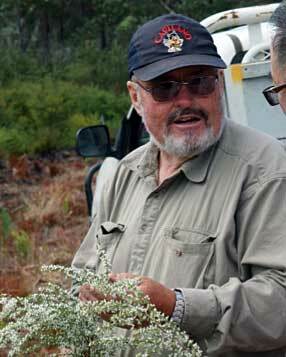 There are however a number of species of Leptospermum, now highly valued. The Leptospermum flower from mid-Spring to Summer after the pollen providing Mellaleucas and wild flowers, and cannot be utilised without a successful pollen supplement. Feeding Bee Build regularly overcomes a dearth of pollen and hives remain strong and produce very profitable quantities of Leptospermum honey. I had been trying to supplement pollen in our hives since the advent of Kra-Waite in the early 1960s. While some of our efforts appeared to give hives a short term stimulus, and some seemed to help strong hives extend brood rearing into periods of pollen shortage, none were able to consistently build the strength of hives. It was with delight I saw how Dewar hives built up when provided Bee Build. 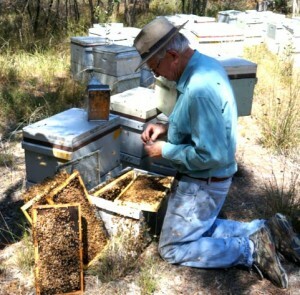 There are often honey flows in Australia that cannot be worked successfully because of a lack of pollen. I am sure Bee Build is a wonderful tool to aid production from pollen deficient flows. I think Bee Build can be a great aid to modern beekeeping and can help compensate for some difficulties that have arisen in recent decades. I congratulate Dewars for their persistence that has brought about the development of this wonderful product.